My body has been trying to tell me (rather loudly lately) that I need to take better care of myself. I have been eating all kinds of junk food and the cold weather keeps me stationary most of the time. It’s time to kick this fitness mode into high gear! I also have to start eating better. I’ve been slacking in this department with unhealthy choices, eating at odd times, and taking in more than I really need to (thanks to recent travel and excessive food portions at restaurants). 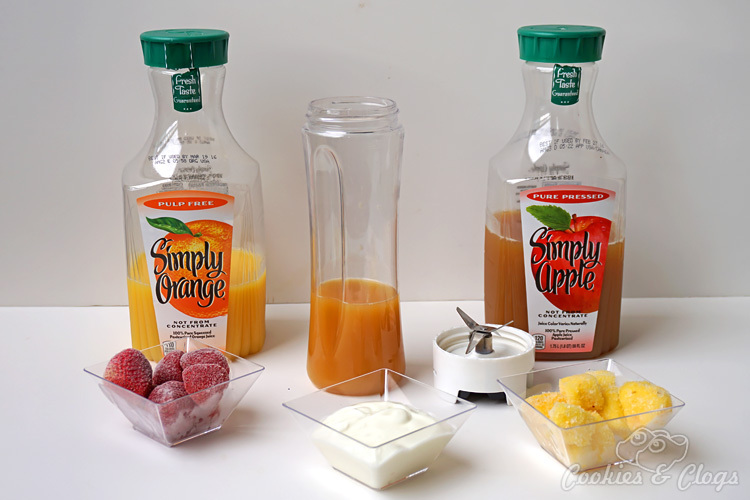 Now, when I was contacted to write a post about Simply Orange beverages, I was more than willing. After all, that’s what we normally drink at home anyway. The timing is perfect and I’m fully ready to take on this “Start Smart. Stay Active. Keep Fit.” campaign! Join me? The first change I’m making is to start drinking homemade smoothies again. Breakfast has always been a challenge for me. Either I can’t figure out what to eat or get to busy and end up skipping it all together. The nice thing about having a smoothie in the morning is that it fills my stomach just enough to last until lunchtime and it’s super quick and easy to make. 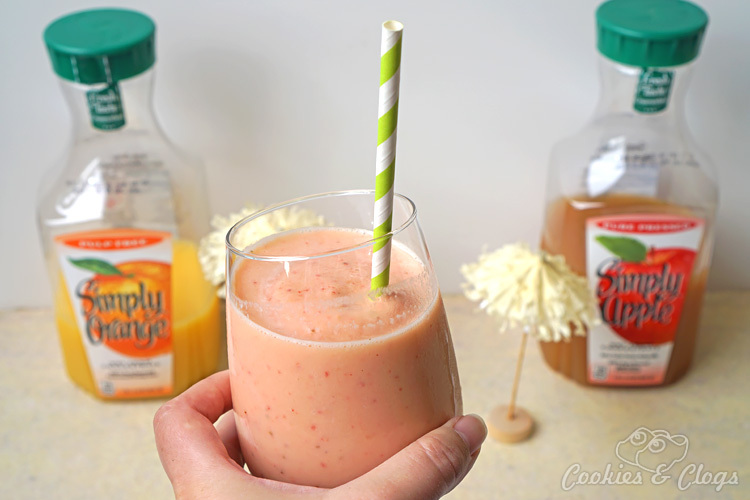 My current favorite is a Jamba Juice Aloha Pineapple copycat recipe I came up with. I’ve been making it for over a year now. My version of the frozen beverage is actually much better for you since it omits the need of pineapple sherbet. 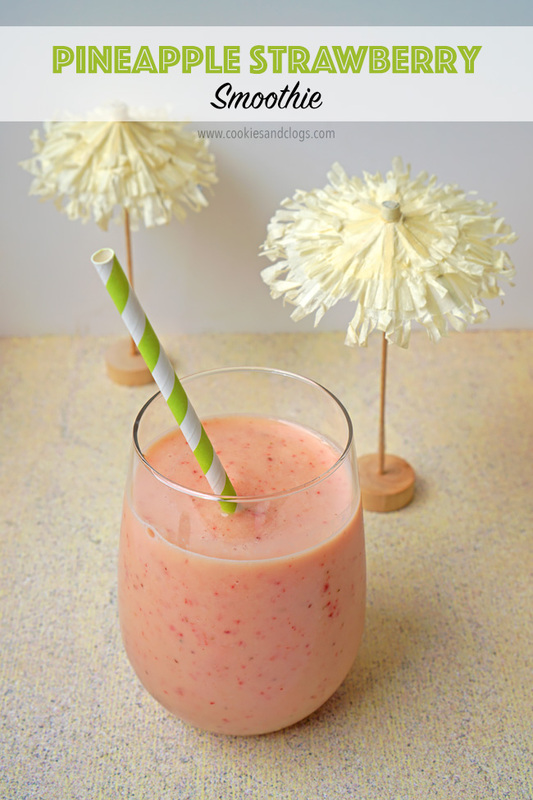 This pineapple strawberry smoothie recipe doesn’t need bananas either and is gluten-free, egg-free, and nut-free. Pour juice and yogurt into blender. Add frozen strawberries and pineapple chunks afterwards, otherwise they might re-freeze together. Enjoy! Makes enough for one 8 oz. glass. Save Your Receipt to Win! I was able to pick up all of the ingredients for this smoothie at Safeway (or Albertsons) and you can too. However, when you buy these products, make sure to keep your receipt! By purchasing Fairlife Milk, Simply Orange, or Odwalla products at your local Albertsons or Safeway stores by March 24, 2016, you can enter for a chance to win 1 of 1000 Misfit Shine Fitness + Sleep Monitors. For more info, visit http://lynk.to/KDGD9. I’m just getting started on my healthy routine now. My family and I actually visited the gym on December 31, 2015 but we haven’t returned since (oops). Even though I did walk a lot during my recent press trips, my Misfit Shine reminds me everyday that I need more steps and more sleep. I still have a long way to go before I feel comfortable in my own skin but we all have to start somewhere. You can follow my progress, albeit slow, on Twitter using the hashtag #StartSmart2016. How are you doing on your fitness and healthy lifestyle goals?